This tutorial clarifies the difference between hidden and very hidden sheets, explains how to make a worksheet very hidden and how to view very hidden sheets in Excel. Are you exasperated because you cannot find the spreadsheet one of your formulas refers to? The sheet does not appear among other tabs at the bottom of your workbook, nor does it show up in the Unhide dialog box. Where on earth could that sheet be? Simply, it is very hidden. What is a very hidden worksheet in Excel? As everyone knows, an Excel sheet can be visible or hidden. As a matter of fact, there are two levels of worksheet hiding: hidden and very hidden. Unhiding a sheet that was hidden normally is very easy. All you have to do is right-click any visible worksheet, click Unhide, and select the sheet you want to view. Very hidden sheets are a different story. If the workbook contains only very hidden sheets, you won't even be able to open the Unhide dialog box because the Unhide command will be disabled. If the workbook contains both hidden and very hidden sheets, the Unhide dialog will be available, but very hidden sheets won't be listed there. While anyone can toggle between TRUE (visible) and FALSE (hidden) by using Excel's Unhide or Hide commands, the xlVeryHidden value can only be set from within the Visual Basic Editor. From the user's perspective, what is the difference between hidden and very hidden sheets? It is simply this: a very hidden sheet cannot be made visible via the Excel user interface, the only way to unhide it is with VBA. So, if you want to make some of your worksheets much more difficult to unhide by others (e.g. those containing sensitive information or intermediate formulas), apply this higher level of sheet hiding and make them very hidden. As already mentioned, the only way to make a sheet very hidden is by using the Visual Basic Editor. Depending on how many sheets you want to hide, you can proceed with one of the following methods. Press Alt + F11 or click the Visual Basic button on the Developer tab. This will open the Visual Basic Editor with the Project Explorer window in the top-left panel displaying a tree of all open workbooks and their sheets. In the Project Explorer window, click on the worksheet you want to make very hidden to select it. In the Properties window, set the Visible property to 2 - xlSheetVeryHidden. That's it! As soon the Visible property is changed, the corresponding sheet tab will disappear from the bottom of your workbook. Repeat the above steps for other sheets if necessary and close the Visual Basic Editor window when finished. MsgBox "A workbook must contain at least one visible worksheet. 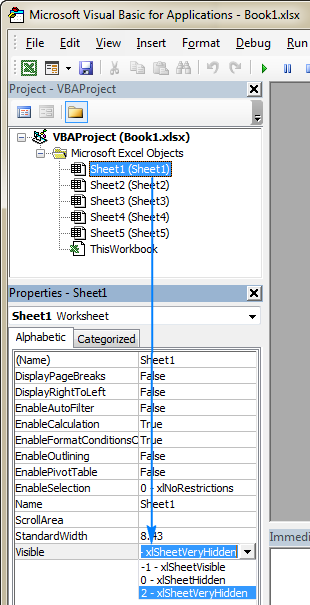 ", vbOKOnly, "Unable to Hide Worksheet"
In case you want to set all selected sheets to be very hidden, go through all of the selected sheets in an active workbook (ActiveWindow) one by one and change their Visible property to xlSheetVeryHidden. MsgBox "A workbook must contain at least one visible worksheet. ", vbOKOnly, "Unable to Hide Worksheets"
Now that you know how to completely hide sheets in Excel, it's time to talk about how you can view very hidden sheets. To be able to see a very hidden worksheet again, you just need to change its Visible property back to xlSheetVisible. In the VBAProject window, select the worksheet you want to unhide. In the Properties window, set the Visible property to -1 - xlSheetVisible. Note. This macro only unhides very hidden sheets, not worksheets hidden normally. If you want to display absolutely all hidden sheets, then use the below one. To show all hidden sheets in an active workbook in one go, you simply set the Visible property of each sheet to TRUE or xlSheetVisible. Open the workbook where you want to hide or unhide sheets. To keep the macro, be sure to save your file as an Excel macro-enabled workbook (.xlsm). For the detailed step-by-step instructions, please see How to insert and run VBA code in Excel. Alternatively, you can download our sample workbook with Very Hidden Sheets macros and run the desired macro directly from that workbook. VeryHiddenActiveSheet - makes an active sheet very hidden. VeryHiddenSelectedSheets - makes all selected sheets very hidden. UnhideVeryHiddenSheets - unhides all very hidden sheets in an active workbook. UnhideAllSheets - shows all hidden sheets in an active workbook (hidden normally and very hidden). In your workbook, press Alt + F8, select the macro of interest, and click Run. I hope this short tutorial has shed some light on Excel's very hidden sheets. I thank you for reading and hope to see you on our blog next week! 18 Responses to "Very hidden sheets in Excel"
Thanks svetlana, for ur share. ur post have been provoked me to know something knew everyday about excel. I can not work with my Excel Sheet because it's protected. And many of these sheets are hidden in it, I can not unhide them ... please help me. This was one of the most helpful blog with every detail. Could you tell me what are the steps to save this file with hidden sheets and send it to others without the danger of being visible. Can this sheet be protected? Before saving the file, protect the Workbook structure with password: Review tab > Protect Workbook. This will prevent unhiding both hidden and very hidden sheets as well as hiding, renaming, moving, or deleting worksheets. For more information, please see How to protect a workbook in Excel. Protecting a workbook will slow down the macros. Using interface only won't work to a protected workbook.. Thus calling a very hidden sheet without unhiding works? Hi, when I run the macro myself I get error 400 and when I download your sheet and ALT+F8 I get a Runtime error 1004. Sheets still very hidden. HELP! The first thought that comes to mind is that you are trying to unhide sheets in a protected workbook. To check this, please go to the Review tab > Changes group, and have a look at the Protect Workbook button. If it is highlighted, the workbook is protected, and you need to remove the protection first. For more information, please see How to unlock a protected workbook in Excel. How do I address the hidden sheet in VBA? Is there a way to write vba code that protects the structure of a workbook and that protects workbooks and worksheets without having a user input a password, but by using vba code in a "password = $%^&assl" type assignment statement? Hope you're having a great holiday season. this post is very useful for my goal. However, if the other (visible) sheets refer to the part of the content of this very hidden sheet (e.g. =VeryhiddenSheet!A1), then the very hidden sheet becomes unprotected, does it? Everybody else can add a new formula (=VeryhiddenSheet!A2) to get its content. You are absolutely right. If someone knows the name of a very hidden sheet, they can get its content with a formula. I don't know a way to prevent this. Could you simply just set the worksheet as protected and have all cells that have a formula as locked and hidden in their properties. This will prevent others from seeing such formula referencing the veryhidden sheet. The name of the very hidden sheet is visible in the VBA editor so, although locking the formula cells is a good idea, it is not 100% foolproof. If the very hidden sheet contains named ranges, the Name Manager also gives away the secret. Even if the user finds the name of sheet #1, it is not possible to read the formulae and virtually impossible to find the real data as it is buried amongst the random stuff. Using the intermediate sheet #2 stops the user finding out where the 'good stuff' in sheet #1 is hidden. 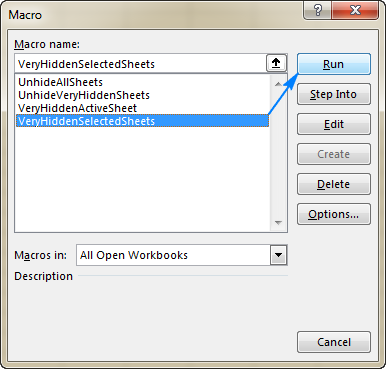 I am not familiar with macros,i needed a code to hide all the sheets in my workbook except the first sheet. And at the same time i want the other sheets to be opened when the user selects the buttons provided in the first sheet. I used the following code & the sheets are getting hidden but the buttons wont take the user to next pages either.